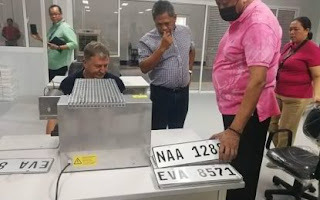 MANILA -- The Land Transportation Office (LTO) will now have the capability to produce its own vehicle plates following its procurement of plate making machines. This, as Department of Transportation (DOTr) Secretary Arthur Tugade inspected seven units of manual embossing machines at the LTO motor vehicle license plate facility on Friday. The plate making machines, which were delivered last Feb. 26, were part of the contract of Trojan Computer Forms Manufacturing Corporation and JH. Tonnjes E.A.S.T. GmbH Joint Venture, which won the contract for the procurement of motor vehicle and motorcycle license plates to address the backlog from July 2016 and beyond. Land Transportation Franchising and Regulatory Board (LTFRB) Chairman Martin Delgra III, LTO Executive Director Romeo Vera Cruz, and other road sector officials of the DOTr were also present during the inspection. The contract stipulated only five manual plate making machines, but the contractor added two more for temporary use at no additional cost. One unit of automated embossing machine will also be delivered in July and is poised to be operational by August this year. “Ayaw na nating maulit ‘yung problema sa plaka. Kaya naman mas maigi kung tayo na lang mismo ang mag-manufacture kaysa nagpapagawa pa abroad na nagpapatagal lang ng proseso. With the proper equipment and training, kaya naman natin,” Tugade said in a statement.